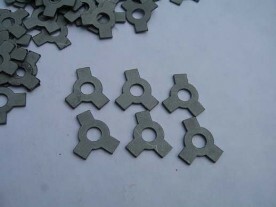 Vintage MG Parts have had these rather obscure washers laser cut and they are perfect copies of the original ENV locking tab washer profiles. 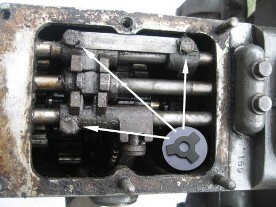 These are used on the selector shafts to secure the selector shaft bolts in place and enthusiasts who have rebuilt their ENV box will be aware that these can only be used once, hence, it is essential not to reuse the originals as this may result in the loss of a tab creating severe damage to the gearbox. The ENV manual gearbox requiring these washers was fitted to the F Type in non-crosstube form with the crosstube case being fitted to the C, J4 as well as the first prototype K3 and Lagonda Rapier and also some Invicta and AC models. Four are required per gearbox.